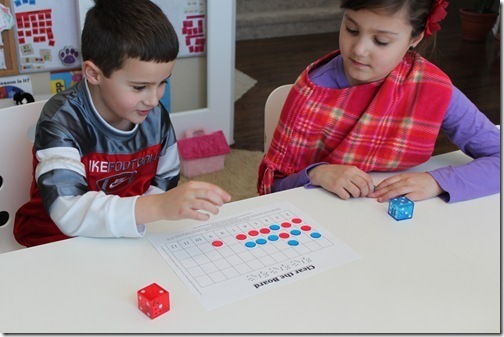 Dice & Domino Math Fun! 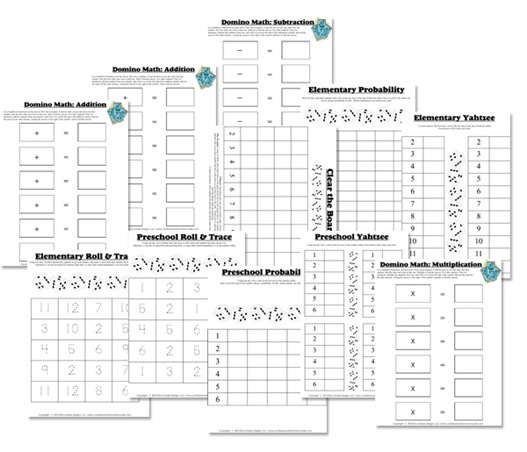 Hi all, I’ve been working on some new fun math worksheets for you and they’re finally done! Awhile back I put up domino addition and subtraction math sheets, but today I’m taking that to a whole new level! I made worksheets for preschool level through about 3rd grade. Here is Tinker Bell doing a roll and trace worksheet. The Teeny Tot wanted in on the action so I made her a probability sheet. She rolls the die and we count the dots on the top. Then I show her which number is the same as what she counted and she fills in a square next to it. Whichever number’s row is filled first wins! Strawberry Shortcake did my domino addition worksheet using the Dice in Dice. Then she asked for a multiplication worksheet, so I added that in to the download as well. Here is Turbo. He’s doing a roll and trace sheet too, but this one is for elementary students. He rolls one die, then adds the numbers on the outer die and inner die together. Then he finds the answer on his sheet and traces over it. Strawberry Shortcake and Turbo are racing to see who can clear their markers off the game board first. 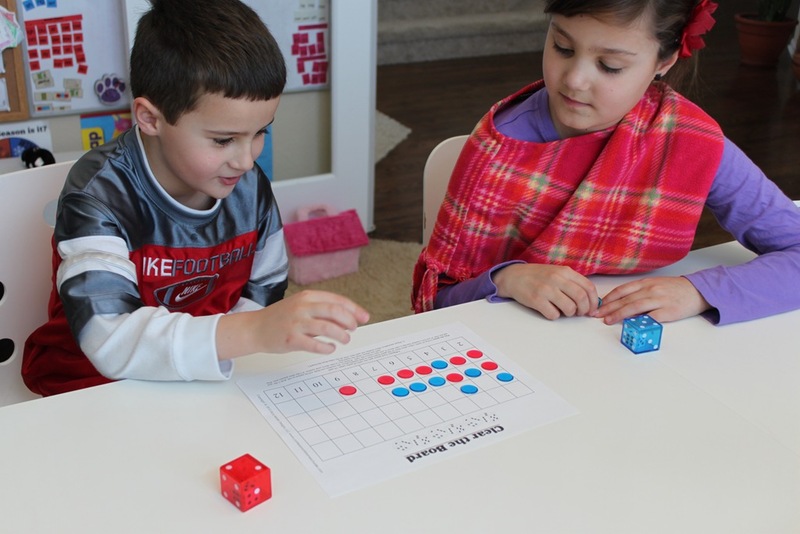 They guessed which numbers would be easiest to roll, then each placed 8 markers next to the numbers they chose. 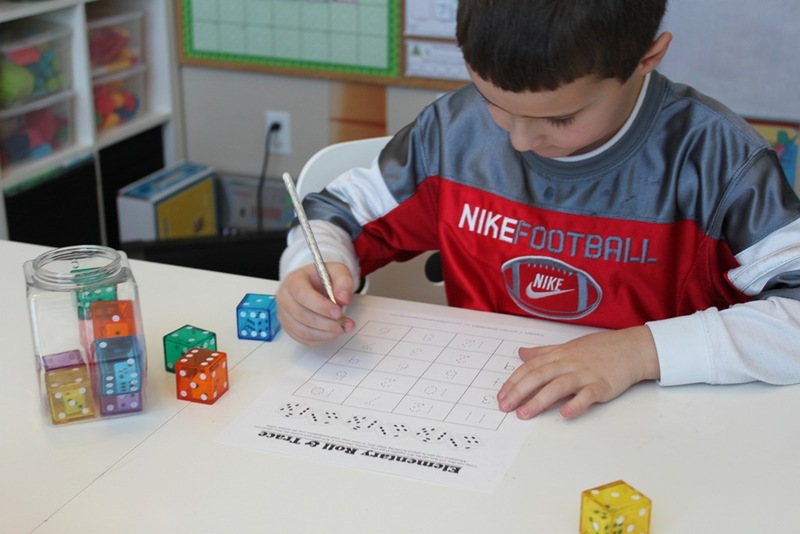 Next they took turns rolling the die and adding the two numbers together. If they had a marker on the board next to that number, they could remove it from the board. First one to clear the board wins. 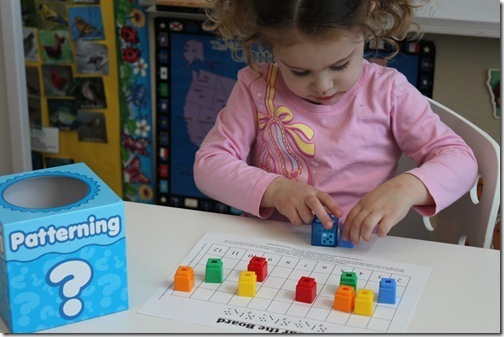 We just used clear bingo markers, but you can use whatever you have handy including cheerios! As soon as the Teeny Tot saw the others playing this game she insisted on it as well. I changed it up a bit for her though. I had her put some colored unifix cubes on the grid, then I put the colored dice in a box and had her pick one out. For each die she picked out, she could remove one cube of the same color. Once her cubes were all off the board she won! Yay! Just to keep it real…then she did this. Threw the cubes and dice all over the table for fun. Which kind of worked out because then I just had her put the cubes all back together by color. 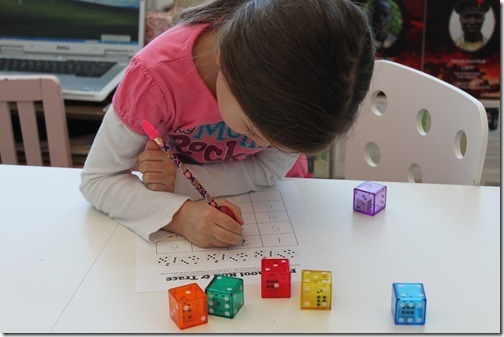 You can certainly use these games with any dice or dominoes you own, but I found these fun dice that help motivate my kiddos to want to do the games! 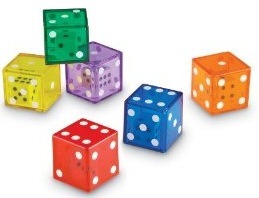 They’re called Jumbo Dice in Dice by Learning Resources. 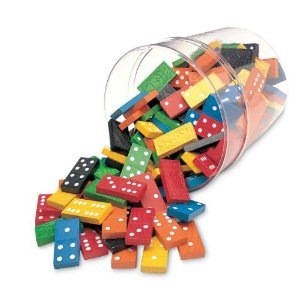 I also have the Learning Resources Double-Six Dominoes bucket. 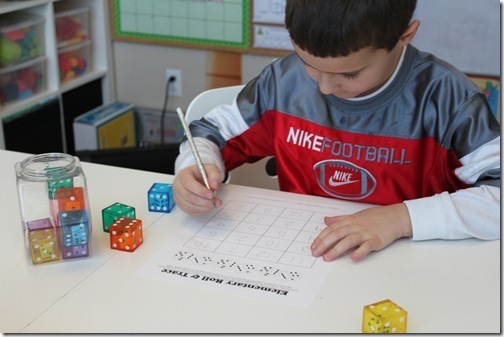 Hope you enjoy the Dice & Domino Math Games! 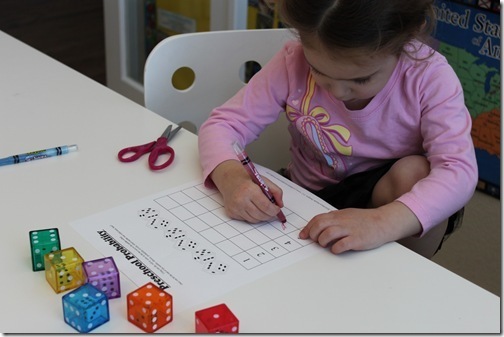 Note: Some of these games were inspired by kidscount1234 , make sure to check out her site for more fun math ideas! This looks like something my boys will LOVE! I just have to tell you something. I’ve been doing a TON of research on curriculum for the last 3 years as I plan to homeschool my twin 3 yr old boys and your site is the ABSOLUTE best one I have seen (and at this point I’ve literally bookmarked well over 100 homeschool sites) in terms of content and MOST DEFINITELY in terms of navigation!! The layout of your site with the seamless, easy navigation is heaven sent for the ADD brain like mine ;o) I love your stie because you have EVERYTHING in it’s proper order, in it’s proper place. I don’t have to fumble through a page upon page to get what I’m looking for. Other sites offer great content but unfortunately are difficult to navigate through because content is not organized, it’s everywhere!! So THANK YOU, THANK YOU and THANK YOU!!!! Thanks so much for the lovely comment, I always love to hear how God uses my blog to bless others! And I’m so glad you find the navigation easy, I do try, but it’s hard to keep it all organized LOL! Thank you very much for sharing your time & talent. These Dice & Domino Math Games are fabulous. In fact, everything on this site is wonderful. Have a blessed day! Thanks so much for sharing. These sheets are great! Thank you! Thank you! Anything to help with making math interesting is so helpful. First kid going through homeschool right now and numbers are not her strong suit. Thank you so much Erica! You really have no idea how much your blog helps me in my homeschool journey. I know you must spend so much time on your blog and I appreciate you so very much. We have been doing Exp. Earth this year (and of course love it) and the other day my husband was just talking to my 7 year and was amazed that he knew all of the capitols to so many countries! Offering fun worksheets and games for free is such a blessing to me and all that come to visit you! We are looking to do roadtrip next year! Thanks so much for sharing these and your other printables! My boys love playing with dice and dominoes. These will be perfect to add to our math curriculum. I’ve been following via Google Reader for over a year and your site is at the top of my list for homeschool resources. Thank you so much for your generosity! Today when I saw this post I was excited. This is my first year homeschooling my daughter in kindergarden and we hit the wall with math and she is not liking it. 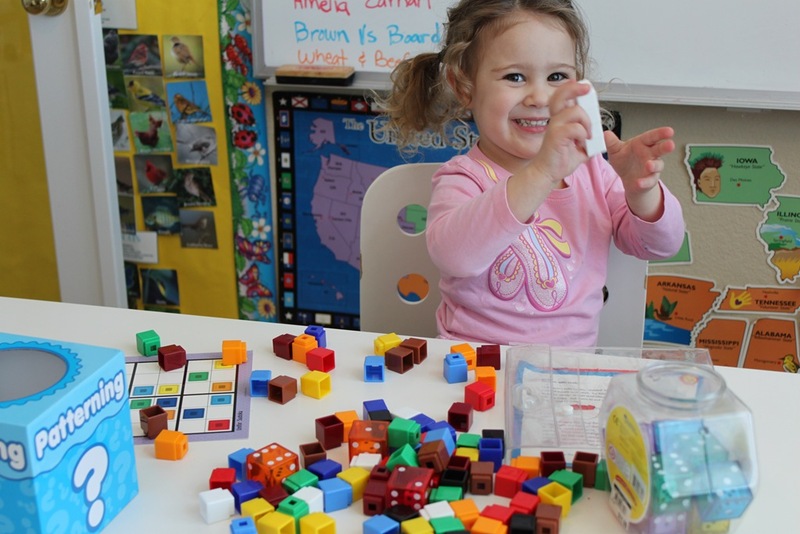 I am so excited to take a break from her math book and just play some math games. Thank you!! Thank you so much for these!! 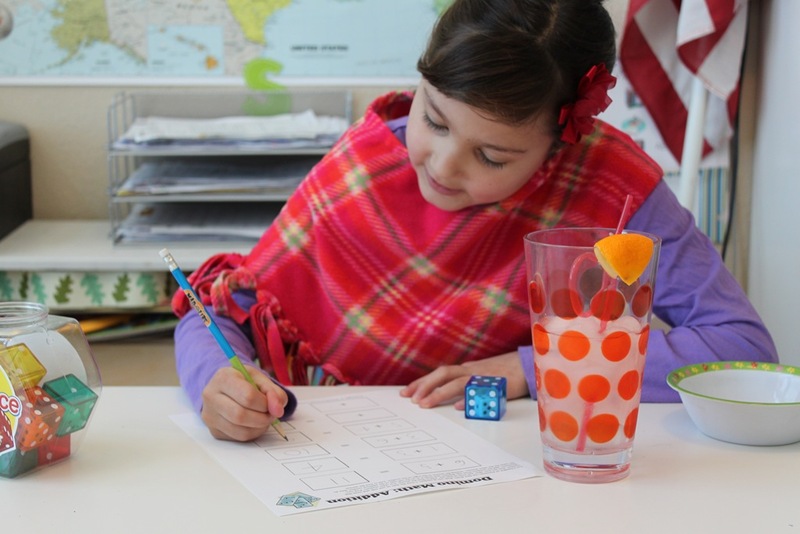 It is so amazing because just today I sat down with my little one to play some dice games to help learn about math. Before bed she begged me to let her play another math game!! (of course I was happy to move bedtime for a math game request) I cant wait to print these off and show her tomorrow. I have almost all of your curriculum materials and am so thankful for your generous heart and the time you have taken to put these together.